April 18, 1867 -- Under "City Improvements" the Chicago Daily Tribune makes these observations . . .
"Why Madison Street from the lake to the river -- one of the great thoroughfares of travel -- should be permitted to remain in its present condition another year, cannot be explained by any rational process . . . As it is, the street is a nuisance, unsafe for travel, and offensive to the eye and nostrils of all who have to use it." "The condition of [La Salle, Franklin, Monroe, Adams, Jackson, Harrison and Polk, from the lake to the river] is of that deplorable state which nothing short of their curbing, grading and paving can remedy. Public health, the general welfare and appearance of the city, as well as the public convenience, demand that these streets be permanently improved, and be no longer abandoned as mud holes and receptacles of filth of all kinds." "These portions of Canal, Clinton, Jefferson, Union, Deplanes and South Halsted streets, lying between Lake and Madison streets, are almost impassable to vehicles, and are very little more convenient to pedestrians. The mud is so deep that no accident insurance company, managed with ordinary prudence, would take a risk from travellers on either of them. Drovers would attempt to swim their beeves, sheep and hogs across the river than attempt to pass over either of these streets from one of the three thoroughfares to the other with their stock." "Halsted street, from Randolph to Madison, is a disgrace to the city. 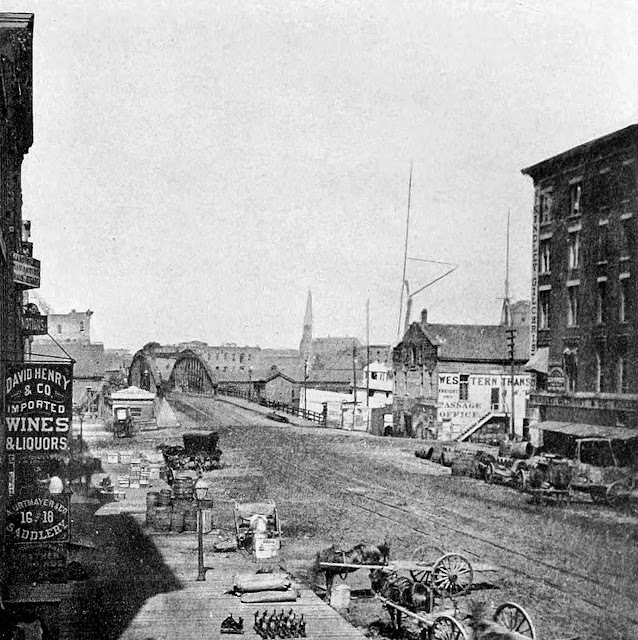 We think if the Board of Public Works would make the voyage of that street on horseback or in canoes, they would, while being fished out by the friendly neighbors living on the banks, appreciate the necessity for finishing the work only commenced by the paving of Lake, Randolph and Madison streets." Somehow, a winter of potholes doesn't seem all that bad. The photo above shows State Street and the bridge across the river on November 2, 1867.